Odd that the first photo would carry a date of 1957. According to Wikipedia, the shopping center opened in 1962. Ugh! True enough. Yet the University does indeed caption this 1957 (and hey, I just automatically date 'em as I sees 'em from the source--you'd think they would know, lol). I Didn't notice the discrepency during posting. Dates shmates! Who cares. Great shots, more importantly!!! I love these old courtyard views. Please do more. That huge canopy in the second shot with the Jetsons looking column is most definately Sears. 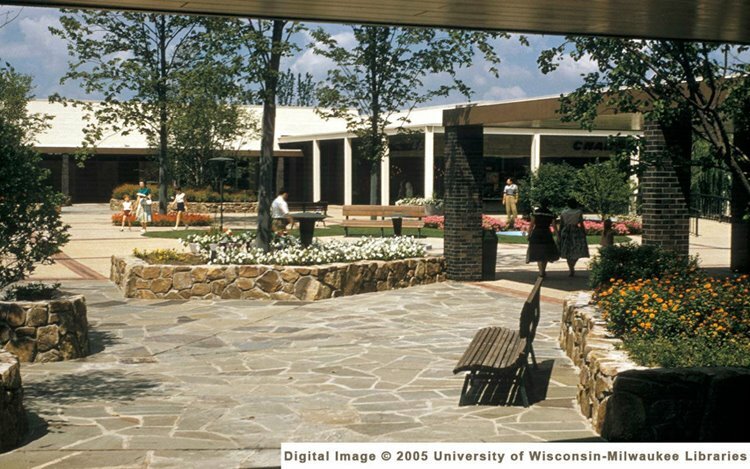 The most amazing thing about Oakbrook is that it still looks pretty much the same! I love shopping there, even in the cold, cold winter. Reminds me of a more upscale version of the original Northwest Plaza in St. Ann, MO (near St. Louis), before the horrible late 80's enclosure. 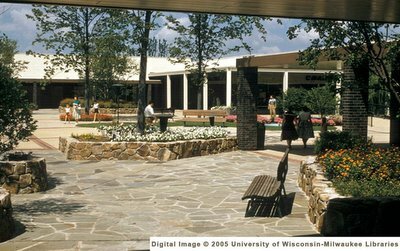 You know, I wouldn't be so opposed to today's big lifestyle centers if they still incorporated outdoor pedestrian malls like this. I would imagine all the parking is at rear here and the larger stores would have had two entrances. There is actually some sort of cohesive experience to having to walk between merchants in a marketplace setting that is totally lost in the new lifestyle centers... I think it's a sign of how lazy we've become as a nation -- that we can't get off our fat butts just to make the walk from Target to Bed Bath & Beyond! This is one of the best malls I've ever shopped at. I've moved back to lower Michigan, but I really miss the Chicago-land malls! So many of them have a retro feel to them. Not too many changes over the years, since they knew it would work way back then! BTW, I am glad I found your blog. Right up my alley! Do you have any more photos like these? They are wonderful! 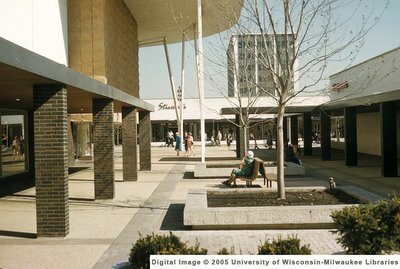 When I was a little girl in the mid '70s, going shopping at Oakbrook Center was a special treat. These two photos give me happy memories of those trips with my mother. Thank you! I spent many pleasant Saturday afternoons as a kid in the Sears store at that mall. In the 70s, entering the store from the north parking lot, you had to walk past the pungent smell of popcorn on the first floor to get to the music section (hi-fi, LPs). My parents figured out they could leave me there while they shopped. I remember when Thick as a Brick first came out and I listened to it all the way through on an 8-track player while I waited for my parents to return. Talk about a mind-altering experience for a 12-year old. Back in 2002 (this mall's 40th anniversary), Oakbrook had banners everywhere on the light poles with old photographs documenting the opening of this mall. Guys wearing black horned-rim glasses and everything you'd expect from the 60's. Cool Stuff! I checked out the photo with the woman walking with the two children, using a magnifying glass. I swear, that COULD have been my mother, my brother, and me! I could not say for sure. The children look nearly exactly like my brother and I (same ages, stature, haircuts, and I had a pair of black shorts, too). My mother had a skirt like the one in the photo and everything else is the same. I could not magnify this enough to be sure, but I do recall that one day when we were at the Oak Brook Mall in the summertime, my mother and I remarked that on that particular day, it seemed less crowded than usual (just like in the photo). I remember a man standing off a ways behind us, too, just like in the photo. I don't know if this is us, but it's a spooky resemblance if it isn't. I know the fashions and all that were worn by many people of that era, but EVERYTHING looks so close to how we looked (ages, statures, everything), it's just spooky. Great older photos.